Questions are an important part of life and learning. Some are trivial while others are vital. There are three questions that I believe are vital to your eternal salvation. These are the very basics, the foundation, of what it means to be a Christian. Get any or all of these questions wrong, and the consequences are fatal. For example, look at the foundation of a house. If the foundation is bad, it does not matter how well you build the rest of the house. You may make some mistakes later, but you can fix them because you have a proper foundation to work with. Another example is a mathematical equation. If you make a mistake at the beginning, the rest of the problem is wrong, not matter how well you do it. John 1:4, 14 1 In the beginning was the Word, and the Word was with God, and the Word was God. 2 He was in the beginning with God. 3 All things were made through Him, and without Him nothing was made that was made. 4 In Him was life, and the life was the light of men. 5 And the light shines in the darkness, and the darkness did not comprehend it. And the Word became flesh and dwelt among us, and we beheld His glory, the glory as of the only begotten of the Father, full of grace and truth. For there is one God and one Mediator between God and men, the Man Christ Jesus, 6 who gave Himself a ransom for all, to be testified in due time. Whenever any organization sets themselves up between you and Christ, they are false and you should run the other way. “11 And every priest stands ministering daily and offering repeatedly the same sacrifices, which can never take away sins. 12 But this Man, after He had offered one sacrifice for sins forever, sat down at the right hand of God, 13 from that time waiting till His enemies are made His footstool. For by one offering He has perfected forever those who are being sanctified. While Jesus Christ was hanging on that cross, suspended between heaven and earth, He was both God’s perfect man, and man’s perfect God! Even after that time, the writings of Paul carried the weight of the Word of God. 1 Thess 2:13 For this reason we also thank God without ceasing, because when you received the word of God which you heard from us, you welcomed it not as the word of men, but as it is in truth, the word of God, which also effectively works in you who believe. And this word of God was delivered once for all. It did not get lost and have to be delivered again. Jude 3 3 Beloved, while I was very diligent to write to you concerning our common salvation, I found it necessary to write to you exhorting you to contend earnestly for the faith which was once for all delivered to the saints. That brings us to the “so what?” question. If the first two questions are answered correctly, what difference does that make for me? Glad you asked! Peter gave them an answer, but it was based on where they were at in the salvation process. They had just then heard and believed, so Peter starts with repentance in verse 38. But let’s take a look briefly at the overall process. do), they must believe it and have faith that it is true. They then repent, which is more that to turn from sin, but turn to God. 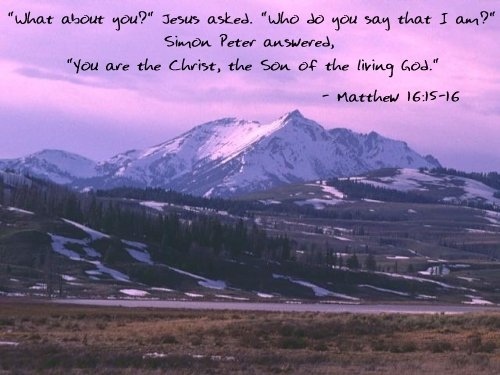 “Therefore whoever confesses Me before men, him I will also confess before My Father who is in heaven. 33 But whoever denies Me before men, him I will also deny before My Father who is in heaven. Or do you not know that as many of us as were baptized into Christ Jesus were baptized into His death? 4 Therefore we were buried with Him through baptism into death, that just as Christ was raised from the dead by the glory of the Father, even so we also should walk in newness of life. For if we have been united together in the likeness of His death, certainly we also shall be in the likeness of His resurrection, 6 knowing this, that our old man was crucified with Him, that the body of sin might be done away with, that we should no longer be slaves of sin. 7 For he who has died has been freed from sin. 8 Now if we died with Christ, we believe that we shall also live with Him, knowing that Christ, having been raised from the dead, dies no more. Death no longer has dominion over Him. 10 For the death that He died, He died to sin once for all; but the life that He lives, He lives to God. What about the sinner’s prayer? There is never a record in the New Testament of ANYONE praying a prayer to be saved. This was an invention of D.L. Moody in the 19th century. But if you must have a sinner’s prayer, here is what the Bible says. It is not a sinner’s prayer and then baptism. Baptism IS the sinner’s prayer. In conclusion, make sure your life is built on the solid foundation of truth. Study it and be solid in your convictions so that the enemy cannot move you from the sure rock of the Word of God. Make sure that you fellowship with a congregation that at least has these basics correct. If these are not right, you can save yourself some time because it means everything else is wrong. Now that you know the truth, obey it. If you really believe it is true, you must do something about it. Your true beliefs will determine your actions. And your foundation will determine your destiny.